Palm Springs Art Museum was founded in 1938 as the Palm Springs Desert Museum at La Plaza in downtown Palm Springs. Natural science exhibits, Cahuilla Indian artifacts, and hiking excursions dominated the institution’s programming. The museum moved several times within the downtown Palm Springs area before building its first permanent structure in 1958, located on the southwest corner of Tahquitz-McCallum Way and Indian Ave. Over the years, fine art gained a greater measure of focus. The 1960's were a busy time for the museum. Executive Director Frederick Sleight arrived on the scene in 1965 with a vision of making the museum "the prime cultural center of the desert." Alice Sleight founded the docent program that same year. As programming grew, so did attendance. 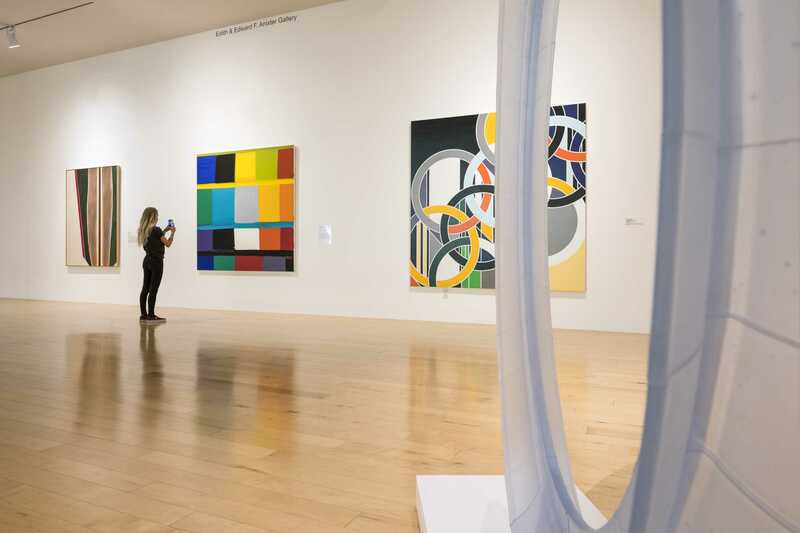 One of the most impressive exhibitions was a 1964 show of paintings by Hans Burkhardt, a Swiss artist widely credited for bringing Abstract Expressionism from New York to Los Angeles. By the late 60's it was evident the 10,000 square foot building was quickly becoming too small. In 1974, architect E. Stewart Williams was commissioned to design the current building for the museum. Further growth resulted in the construction of the Doris and Walter N. Marks Administration Building and the 1996 completion of the Steve Chase Wing and the Education Center. Museum director Frederick Sleight (left) and Walter Marks (right) review the model of the new Palm Springs Desert Museum (finished 1976). Major renovations, and even bigger donations of art, transformed the institution, which also sharpened its programming with nationally significant exhibitions. 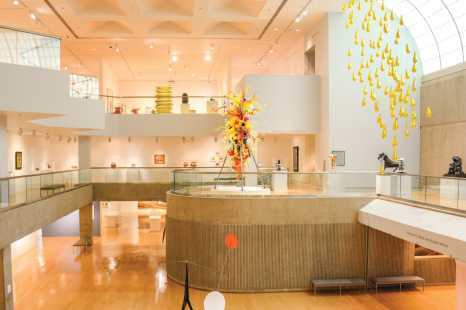 In April 2004, the Board of Trustees decided to shift the museum's focus from a multi-disciplinary museum to a world-class art museum with a vibrant theater program. In evaluating the current strengths and directions of the museum, it became clear that the art collections were growing and that the art audience was expanding – primarily in the areas of architecture, photography, and contemporary glass. A study of the area's other institutions also brought a realization that there were other established organizations providing exhibitions in the natural sciences. One year later, in April 2005, the museum officially changed its name from Palm Springs Desert Museum to Palm Springs Art Museum to reflect its emphasis on the visual and performing arts. The museum remains committed to serving as an innovative community cultural center, and expanding its exhibitions, programs, and services in the visual and performing arts. In 2012, the museum opened a satellite exhibition and education space in Palm Desert. It features an architecturally distinctive building named The Galen that presents ongoing and temporary exhibitions of internationally important art and is surrounded by the Faye Sarkowsky Sculpture Garden that features significant sculpture works surrounded by beautifully landscaped gardens. In 2011, the museum purchased the Santa Fe Federal Savings & Loan building designed by E. Stewart Williams in 1960. Located in downtown Palm Springs, it was reopened as the Palm Springs Art Museum Architecture and Design Center, Edwards Harris Pavilion in 2014. This hub of the museum's exploration of architecture and design features related exhibitions and educational programs. The collection also includes Frey House II, the historically significant residence in Palm Springs that architect Albert Frey designed for himself in 1963 and bequeathed to the museum upon his death in 1998. Accredited by the American Association of Museums, the Palm Springs Art Museum has 28 galleries, two sculpture gardens, four classrooms, a resource centers, an artists center, five storage vaults, a 85-seat lecture hall, a 433-seat theater, a 1,000 square-foot store, and a popular local bistro.